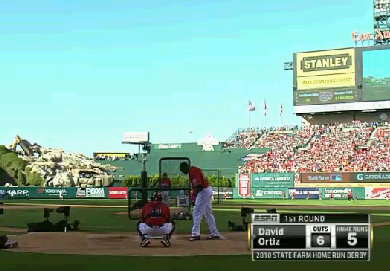 The 2010 Home Run Derby takes place tonight and ESPN is making it possible for you to watch it live online. ESPN3.com has really evolved lately by providing live online sporting events. The majority of the 2010 FIFA World Cup was broadcast live online via ESPN3, to include the World Cup final. The 2010 Home Run Derby contestants are Milwaukee’s Corey Hart, Florida’s Hanley Ramirez, Arizona’s Chris Youngand St. Louis’ Matt Holliday for the National League, and Boston’s David Ortiz, Toronto’s Vernon Wells, the Yankees’ Nick Swisher, and Detroit’s Miguel Cabrera for the American. There are three rounds. In each one, batters get 10 “outs” to hit as many homers as they can. An “out” is any swing that doesn’t produce a home run.